I missed the movie, mostly because the poster featuring what appears to be a mother and daughter, doesn't say that it's anything special except that Meryl Streep performs in it. For me, though, that was enough, Streep is a giant amongst actors today, and she was probably unlucky not to walk away with another award for this performance at the recent Oscar's. Trying to take out the video DVD though was mission impossible at first, because day after day J&J was booked out, and when you tried to book it the next day: 'Sorry it's already booked out for tomorrow.' That's a sign of a flick worth watching. WIKI - Child repeatedly recalled her first meal in Rouen as a culinary revelation; once, she described the meal of oysters, sole meunière, and fine wine to The New York Times as "an opening up of the soul and spirit for me." From this experience she went on to study french cuisine and finally wrote a book on french cooking for American audience, television shows followed, and the rest is history. Her book was first rejected the manuscript for being too much like an encyclopedia. Finally, when it was first published in 1961 by Alfred A. Knopf, the 734-page Mastering the Art of French Cooking was a best-seller and received critical acclaim that derived in part from the American interest in French culture in the early 1960s. Lauded for its helpful illustrations and precise attention to detail and for making fine cuisine accessible, the book is still in print and is considered a seminal culinary work. It is interesting how publisher's can be wrong - one person's encyclopedia is another's 'seminal culinary work'. And it's interesting how the breakthrough lead to further success. Child wrote magazine articles and a regular column for The Boston Globe newspaper. What is obvious is that Child's was a character, her physical dimensions [very tall] extending into a loud but magnimous personality. Making the cover of TIME magazine in 1966, she was referred to as 'The Lady of the Ladle'. 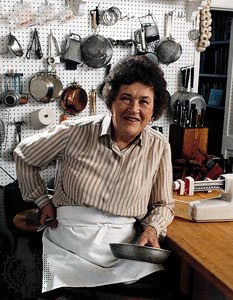 If cooking isn't really your thing, there is a parallel narrative to the Julia Child's story, and that is the narrative of modern-day New Yorker Julie Powell, who started a cooking blog titled The Julie/Julia Project. For anyone who blogs, lives with someone who blogs, or would like to blog, this side of narrative probably represents the zeitgeist best. You'll discover what sort of person and what style of writing attracts an audience and how Powell used her blog to launch a career as a writer. Interestingly, Julia Child's wasn't impressed with Powell's blog [which attended to cook all of her 500+ recipes in 365 days], and called it a stunt. In Child's opinion she did not see Powell as a serious cook. Perhaps Child's was also concerned that she might disappoint, as an older woman, in the flesh. WIKI - Child's editor, Judith Jones, said in an interview: "Flinging around four-letter words when cooking isn’t attractive, to me or Julia. She didn’t want to endorse it. What came through on the blog was somebody who was doing it almost for the sake of a stunt. She would never really describe the end results, how delicious it was, and what she learned. I can empathise with this view as I've met a well known SA blogger [MushyPeason Toast] who has a well known blog but filled with expletives and toilet humor. This may suit certain audiences, but it does come across as a self-indulgent, selfish and conceited person using cuss words to attract attention. 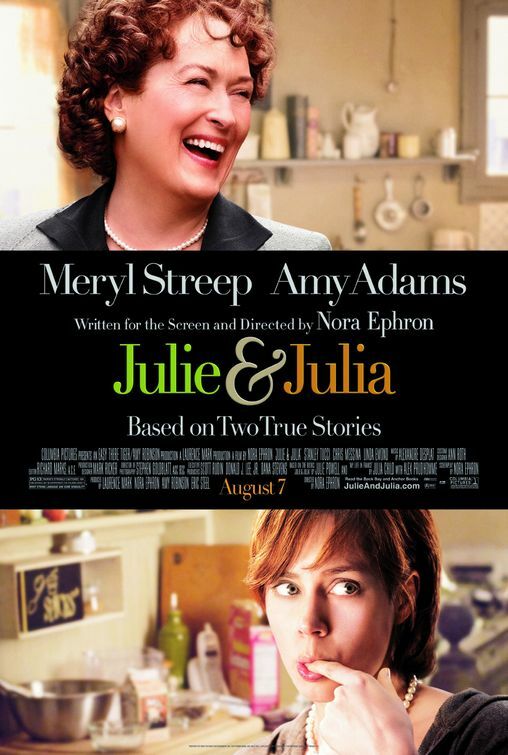 In any event, the narratives of both Julie and Julia are funny and moving and well worth a watch with someone close to you.